Anyone can subscribe to the GIA Reader or send a subscription to a friend! 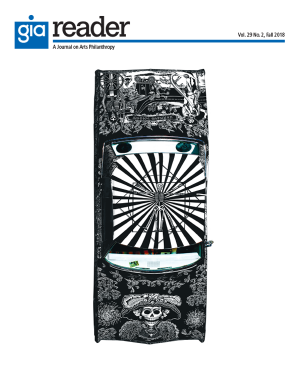 Artists, grantmakers, arts managers, cultural critics, and historians contribute to GIA’s periodical, the Grantmakers in the Arts Reader, which features readings on arts and culture, reports from arts grantmakers, and summaries of recently published reports, books, and studies. To purchase the current issue, see below. Back issues are also available. Contact us at gia@giarts.org or call (929) 452-3740. * All Reader subscriptions begin with the current or most recent issue. Please allow up to two weeks for delivery.